No doubt most of the people buying this box know that the music it contains is necessary to any serious jazz collection (if not to life itself). But to spell it out for any who haven't got the word yet, Count Basie's pre-war band epitomized that core quality in jazz called swing. 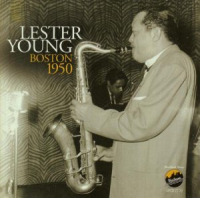 And saxophonist Lester Young was the first soloist who showed that it was possible for others to reach the incredible heights achieved by Louis Armstrong in the mid '20s. There are important antecedents in each instance. It's not as if the Basie Orchestra could swing any harder than those led by Fletcher Henderson, Louis Russell or Bennie Moten and Young's incredible architecture couldn't have existed without the foundation laid down by others, especially Coleman Hawkins, who, more than even Armstrong, had created the template for constructing jazz solos. But the Basie-led rhythm section - the leader's piano, Freddie Green's guitar, Walter Page on bass and Papa Jo Jones on drums - created a model of tightly meshed, perfectly balanced ensemble playing that has never been surpassed. Lester Young's tenor tone was light compared to the Hawkins' full-bodied standard and his harmonic sense was quite advanced, but the most revolutionary aspect of his playing was his way of phrasing, which ran across bar lines in a way never heard before. The Basie band also boasted many other wonderful soloists like trumpeters Buck Clayton and Harry Edison, trombonists Dicky Wells and Vic Dickenson, alto saxophonist Earl Warren and, of course, Basie himself, as well as great vocalists in Jimmy Rushing and Helen Humes. And while the arrangements were not as complex as those employed by Duke Ellington, they were just as effective. Many of the original Basie-ites (including the Count) had been members of Bennie Moten's group and began their recording careers several years before the 1936 session that kicks things off here, but this date marked Lester Young's studio debut. His first recorded solo, on "Shoe Shine Boy," is a shining example of how perfect an improvised statement can be and he matches it time and again on this set. This session is one of several by smaller groups drawn from the Orchestra's personnel that balance the classic sound of the big band and allow a little more room for the soloists. There are also a couple of non-Basie sessions: one featuring the rather heavy organ sound of Glenn Hardman, the other a wonderful 1940 date under the titular leadership of Benny Goodman which found the clarinetist and his brilliant young guitarist Charlie Christian joining Young, Clayton and the Basie rhythm section. Some may bemoan Mosaic's decision not to include the 20-odd Basie titles from the period that didn't feature Young solos, but no one will mind the inclusion about a dozen unissued alternate tracks that include several 'new' Young solos. 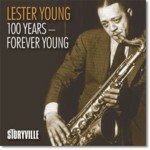 Along with the state-of-the-art sound, beautiful photos and great notes by Loren Schoenberg, they help to give those who never saw them a closer view of Lester Young with Count Basie than we ever had before. Track Listing: CD1: Shoe Shine Boy (A); Evenin' (A); Boogie Woogie (A); Oh, Lady Be Good (A); I Ain't Got Nobody (B); Goin' To Chicago (B); Live and Love Tonight (B); Love Me Or Leave Me (B); What Goes Up Must Come Down (C); Taxi War Dance (C); Don't Worry 'Bout Me (D); And The Angels Sing (E); If I Didn't Care (E); Twelfth Street Rag (E); Miss Thing (Pt.1) (E); Miss Thing (Pt.2) (E); Shoe Shine Boy (A); What Goes Up Must Come Down (C); Taxi War Dance (C) (alt tk); Don't Worry 'Bout Me (D). CD2: 1. Lonesome Miss Pretty (F); Bolero At The Savoy (F); Pound Cake (F); You Can Count On Me (G); Song Of The Islands (I); Clap Hands, Here Comes Charlie (I); Dickie's Dream (J); Lester Leaps In (J); The Apple Jump (K); I Left My Baby (K); Riff Interlude (K); You Can Count On Me (G); Dickie's Dream (J); Dickie's Dream (J); Lester Leaps In (J); I Left My Baby (K); Riff Interlude (K); Riff Interlude (K); Riff Interlude (K); Riff Interlude (K). CD3: Between The Devil And The Deep Blue Sea (L); Ham 'N' Eggs (L); Hollywood Jump (L); I Never Knew (M); Tickle-Toe (M); Let's Make Hay While The Moon Shines (M); Louisiana (M); Easy Does It (N); Let Me See (N); Blow Top (O); Between The Devil And The Deep Blue Sea (L); Between The Devil And The Deep Blue Sea (L); Between The Devil And The Deep Blue Sea (L); Ham 'N' Eggs (L); Ham 'N' Eggs (L); Hollywood Jump (L); Let's Make Hay While The Moon Shines (M); Louisiana (M); Let Me See (N); Blow Top (O). CD4: Evenin'; The World Is Mad (Pt.1); The World Is Mad (Pt.2) (P); Ad Lib Blues (Q); Wholly Cats (Q); Charlie's Dream (Q); I Never Knew (Q); Lester's Dream (Q); What's Your Number? (R); Five O'Clock Whistle; Broadway (S); China Boy (H); Exactly Like You (H); On The Sunny Side Of The Street (H); Upright Organ Blues (H); Who ? (H); Jazz Me Blues (H); Exactly Like You (H); What's Your Number? (R); What's Your Number? (R); Five O'Clock Whistle (S); Five O'Clock Whistle (S); Broadway (S). Personnel: (A) Carl "Tatti" Smith; Lester Young; Count Basie; Walter Page; Jo Jones; Jimmy Rushing. 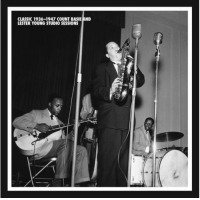 (B) Buck Clayton; Shad Collins; Dan Minor; Lester Young; Count Basie; Freddie Green; Walter Page; Jo Jones; Jimmy Rushing (C) Buck Clayton; Shad Collins; Harry Edison; Ed Lewis; Dan Minor; Benny Morton; Dicky Wells; Earle Warren; Buddy Tate; Lester Young; Jack Washington; Count Basie; Freddie Green; Walter Page; Jo Jones; Helen Humes; Jimmy Rushing (D; E; F; G; I; K; L) Same as (C). 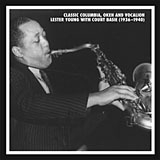 (H) Lee Castle; Lester Young; Glenn Hardman; Freddie Green; Jo Jones. (J) Buck Clayton; Dicky Wells; Lester Young; Count Basie; Freddie Green; Walter Page; Jo Jones (M) Buck Clayton; Harry Edison; Al Killian; Ed Lewis; Vic Dickenson; Dan Minor; Dicky Wells; Earle Warren; Buddy Tate; Lester Young; Jack Washington; Count Basie; Freddie Green; Walter Page; Jo Jones; Helen Humes; Jimmy Rushing (N; O; P; R; S) Same as (M). (Q) Buck Clayton; Lester Young; Benny Goodman; Count Basie; Charlie Christian; Freddie Green; Walter Page; Jo Jones.